This weekend, my darling and I both went back to our own family home to find childhood photos of ourselves. My darling went all the way back to his hometown (in Hikone) to find his. As you might know, we need to create a childhood photo montage video presentation which will be shown at our wedding reception. In Japan, photo montage presentation is the highlight of entertainment for the guests. Combined with our favorite music, from childhood photos to dating and engagement photos, it is a special reflection on our past to tell the story of us, who eventually meet and fall in love. Well, there were hundreds of albums at my family home so I couldn't select ones I want to use in a snap... I think I'll go back again since my family home is just a few-minute walk from where I live. Yeah, our doggy was doing fine. 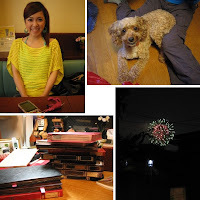 I saw Tamagawa Fireworks from home which we saw up close last year.